summary: click "set camera" IMMEDIATELY after importing each element before clicking or doing anything else... then adjust as desired. STEP 1) VERSION 2.0: When you add a new element (image or text) it will appear on your canvas already selected in a reddish rectangle. (and the thumbnail image of the element will be highlighted in blue in the thumbnail tray at the bottom of the screen) but the camera will not zoom in or out if you don't click anything yet. VERSION 1.3.26: When you add a new element (image or text) it will appear on your canvas already selected in a rectangle with blue squares at the corners (and the thumbnail image of the element will have a green border around it in the timeline at the bottom of the screen) but the camera will not zoom in or out if you don't click anything yet. you can then manually zoom in or out (using the plus and minus icons in the lower left corner of the canvas ) or scale the element or move the element by click+dragging it, or move the camera by dragging the canvas. If you change the camera position or zoom in or out, be sure to click "set camera" again if you wish to save the new position. you can then manually zoom in or out (using the plus and minus icons in videoscribe) or scale the element or move the element or the camera. 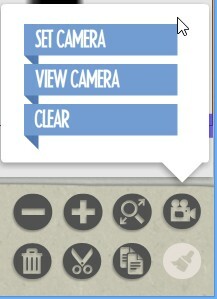 If you change the camera position or zoom in or out, be sure to click "set camera" again to save the changes. step 4) BOTH VERSIONS: After you set the camera for that element, any time you select and click that element in the timeline the camera will now move to the position that you have set instead of just zooming in to the original default position. step 5) BOTH VERSIONS: repeat the process for each element that you add if you wish to control their camera positions. It's a pity that the VIEW camera is not among the options in v. 2.0!!! it is really annoying because I cannot adjust the rest of my images to the previous ones... can you please get the VIEW camera back from previous version into the 2.0? Just to say - This is the most frustrating software I've ever used! The topic originally pertained to version 1.3.26 of videoscribe. I have now added instructions for version 2.0/newer as well. and maybe sparkol will implement it in the future. Sorry you're having issues with the camera. Wondering if you have had an opportunity to watch the tutorials for version 2.0?